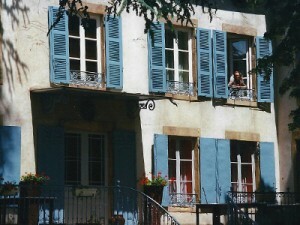 During our honeymoon, my husband Steve and I spent four days in the Northern Rhône. We’d had a week in Paris—identified during the planning stages as Most Romantic Honeymoon Destination Possible—a week spent eating, walking, sightseeing, eating, sleeping, and eating. It was early June, and the weather was dulcet. We hit the all the Parisian tourist spots: the Tour Eiffel, the Louvre, Sainte-Chapelle, Berthillon—but also let ourselves stumble onto the extraordinary: a Sunday afternoon tango gathering on the banks of the Seine, a tiny chocolate shop where the chocolatier came out in lab coat to share his day’s creations. We dined in bistros, forgoing fancier restaurants, and picnicked in our hotel’s tiny garden on cheeses, bread, wine, and pastries. Did I mention the food? Paris is wonderful, but we both love Rhône wines with an ardent passion, so had planned to finish our time abroad with a short tasting trip. We figured a long weekend in the Northern Rhône would give us a chance to taste from the major producers—Chapoutier, Jaboulet Aîné, Guigal—and from a few of the smaller ones, too. This would serve as a kind of a reconnaissance, a chance to test, and sample, the waters, and to get a sense of what tasting wine in France is like. So we hopped a TGV to Vienne, rented a little Fiat, and sped down river to Condrieu, pulling into town on a Thursday afternoon. We checked into a tiny hotel, La Réclusière, then raced to Guigal to join a tour that was scheduled for the top of the hour. My French is unstable at best—“Pardonnez-moi while I make steak haché out of your beautiful langue”—so when we arrived breathless and fifteen minutes late at Guigal, I struggled to explain to the puzzled, very non-Anglophonic front desk attendant that we’d made prior arrangements. She and I were reaching a pique of exasperation when an elegant young man in an impeccable suit swept from the back office. “How may I help you?” he asked, throwing me a lifeline with flawless English. This was, of course, Philippe Guigal, son of famed winemaker Marcel and an enologist in his own right, a partner in the enterprise. That night we dined in Ampuis on salade nicoise and roast chicken, ordering Condrieu and Côte-Rôtie by the glass, then falling into bed to sleep like newborn kings. Friday, day two. We rose early, breakfasting in the hotel’s bright dining room, slathering our bread with confiture and Beurre Échiré, the sweet, creamy French butter so beautifully cultured it’s lightly reminiscent of brie. 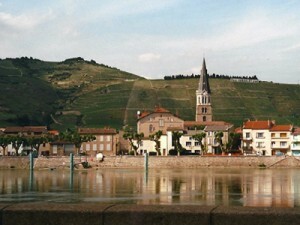 After breakfast we folded ourselves once again into our tiny car and headed downriver to Tain-L’Hermitage, a small town ringed by a gravelly collar of steeply sloped vineyards. This is the heart of the diminutive Hermitage appellation, 321 acres of Syrah clinging to dizzyingly pitched terrain. The hillside is divided into myriad climats, each dominated by a different soil—granite, limestone, or clay—each in turn subtly influencing the temperament of the resulting wine. Our target in Tain was the Chapoutier tasting room, but we weren’t in a rush. In the outskirts of town we took a twisting side road, rising steeply into the plantings, parking at last behind one of the giant hillside signs, visible for a mile, that declare each winery’s holdings. We stepped out of the car to take it in. The weather was gray and rainy, the broad Rhône twisting in the mist below us like a giant blue serpent. 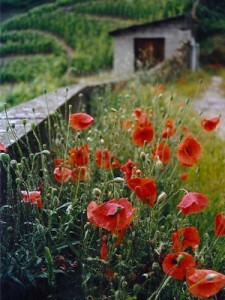 The red spring poppies were in full bloom, their bright papery petals beaded with rain, scattering like drops of blood along the road’s loose margin. Sang des Cailloux—“blood from stones.” We’d had a wine by this name from Vacqueras, in the Southern Rhône—actually, we’d had a lot of it; it was our house wine for a year or so, before the dollar plummeted and French wine prices shot skyward. The label sported a spare, elegant engraving of the vineyard, with lumpy soil footing all the vines. “Cailloux” is French for pebbles, and even after pulling open Jancis Robinson’s Oxford Companion to Wine to read the article STONES AND ROCKS, we assumed the soil was simply, well—stony, studded with small pebbles, much like our New England till. I should know better. I’m an experienced gardener, but since I am a terrestrial being, I sometimes forget that much, if not most, of a plant is deep underground, out of sight. This is where the veins of the plant meet the veins of the earth, and it’s where a lot of the magic happens, where water and minerals and microbes work an artful chemistry that fires the system and keeps it running. The roots are the plant’s engine room, thrumming and pulsing and driving their steam heat upstairs to fruit and seed, leaf and shoot. We gardeners like it fertile. We’re trying to coax the maximum production in a short annual growing cycle, so we throw a lot of nutrients at the soil, then beg the plant to shoot the moon, because we only have one chance before frost flies in. Viticulturists have other priorities. They’re raising perennials. Each season brings a new crop, a new cycle of flower, fruit, seed, and harvest, and each harvest is different. But the eye must remain fixed always on a sustainable alchemy, a stable marriage of vine to soil. Harvest will happen this fall, and the next, but these vines will likely outlive the vintner. They’re in it for the long haul. 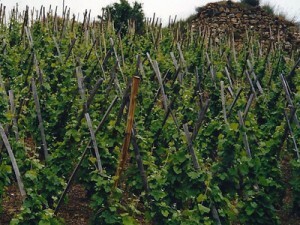 In the vineyard, leaner soil is usually better. It keeps the canopy from overwhelming the vine, and keeps the fruit concentrated. It makes the roots tap deep in search of water, creating a network that buffers the plant against the vagaries of weather. And a thick mulch of stones offers good drainage while limiting evaporation. Here in Tain, the Rhône takes a sharp east bend from its southerly route, so the vineyards above town tip nearly due south, amplifying the sun’s impact. The stones readily conduct and re-radiate heat, mitigating temperature swings between day and night. The steep slopes bake all day—Côte-Rôtie translates literally to “roasted slopes”—and this retained heat helps ripens the fruit. Descending finally from the vineyards into the village, we found Chapoutier’s tasting room, parked, and pushed open the door. It was dim but welcoming, with a long bar along one side and climate-controlled storage along the other. A few chairs and tables had been placed casually about, and in the center of the room a portion of floor had been cut away and topped with sturdy glass to create a modest exhibit space. Below the glass were compartments filled with stones, each type separately identified. Clearly we weren’t the first visitors to marvel at the rocky terrain. Perhaps the good people of Chapoutier had grown weary of answering for their bony soil. A revelation. We’d been to tasting rooms in the States where perhaps as many as a dozen wines might be on offer, but rarely the full library. Still, as visitors painfully aware of our tourist status, we erred on the side of restraint, selecting only three reds and a dessert wine, all from the 1999 vintage. We started with a Crozes Hermitage “Les Meysonniers.” Despite its sumptuous nose, this was thin on the palate and a bit disappointing. The Côte-Rôtie “Les Bécasses,” meanwhile, was young and quite tannic, but beautifully layered and full of promise. A Hermitage “Monier de la Sizeranne” offered an earthy, funky nose; here was a Syrah with a deep, meaty core. Finally, the dessert wine, a Muscat de Baumes de Venise, was like drinking a beautiful flower, with a honeyed nose and unctuous full blossoms in the mouth. We didn’t buy any wine at Chapoutier. It was good but not spectacular, and it’s possible it wouldn’t show as well back home as it did in situ. There is an ineffable affinity between a wine and its place, and when one takes a sip of wine with a breath of the air that once washed its vines, there is an exquisite harmony, not replicable elsewhere; an experience of terroir. But really, what were we thinking? I’d bet the Côte-Rôtie and Hermitage would be knockouts by now. Leaving Chapoutier, we headed south out of town to visit Jaboulet Aîné, a producer famous for the Hermitage “La Chappelle,” named after the picturesque stone chapel high in the vineyards overlooking Tain. 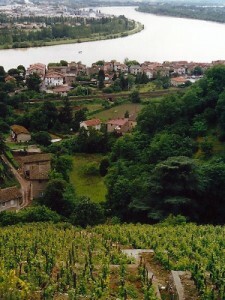 The winery’s production, though, ranges up and down the Rhône appellations, from Crozes-Hermitage and Condrieu in the north to Gigondas, Vacqueras, and Tavel in the south. We pulled into the parking lot, grateful for the enormous sign above the entry, since the cement stucco building looked more like a shopping mall or middle school than a winery. Inside, too, the modern office spaces were teaming with young professionals in business attire; it seemed we could have been in any industrial building anywhere in France, so generic were the surroundings. The staff was a bit surprised by our unannounced arrival, but one young man gamely took us into his charge and led us around. We finished the tour in a tasting room that was rather more laboratory than lounge, appointed with sleek white benches and rows of sterile glassware. Our guide poured us tastes, amiably chatting about the wines and spitting expertly into a long steel sink, delighted at the opportunity to practice our language, and indulgent in our efforts to practice his. We bought a bottle of the Côte-Rôtie “Les Jumelles” and headed back to our hotel, amused at the wholly different experiences at Chapoutier and Jaboulet. Still, we’d tasted some wonderful wines, an experience made all the more wonderful by being in the heart of the appellation, with fresh images of the vineyards dancing behind our eyes. Meg Houston Maker is a communications strategist and nonfiction essayist with a passion for food and wine. She authors Maker’s Table, a journal of food, wine, and the pleasures of the table, and is Executive Editor for Palate Press. Follow her on Twitter @makerstable. This is a beautiful piece, evocative and effective. Looking forward to the conclusion… and to our own visit to the Rhone. Evan, thanks for your kind words. I hope you and Morgan go soon. Steve and I both slap our heads wondering why we haven’t returned. Lovely piece! Northern Rhône is #1 on my list of wine regions to visit. Did you bring back any cailloux with you? Sasha: sadly, no cailloux returned in my pockets, only in my memory. When you go, let us what stones you turned over, and what you found. What a beautiful post. I desperately want to go to the Rhone, so this article only serves to further fuel my desire. Looking forward to reading part 2. — Thank you for perfectly capturing the intangible essence of wine tasting. Beautifully written!! Palate Press: The online wine magazine, in The New York Times (http://www.nytimes.com/info/wines/). Howard G. Goldberg applauds the beautiful writing of Meg Houston Maker. Congratulations Meg, so very well deserved.